Want to join the Groovy Gals Ring? Click here to find out how. This Ring Of Friendships site is owned by SKAZKA. Click Here to join the Ring Of Friendships & know more about it! Roll the dice for a random link or add your site to the random link database. This Lesbian Connection site is owned by SKAZKA. Want to join the Lesbian Connection? This Women's Ring site is owned by SKAZKA. 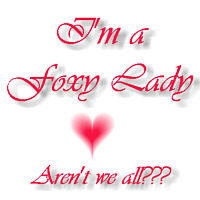 and I am a Foxy Lady! This Women-Friendly Website site is owned by SKAZKA.